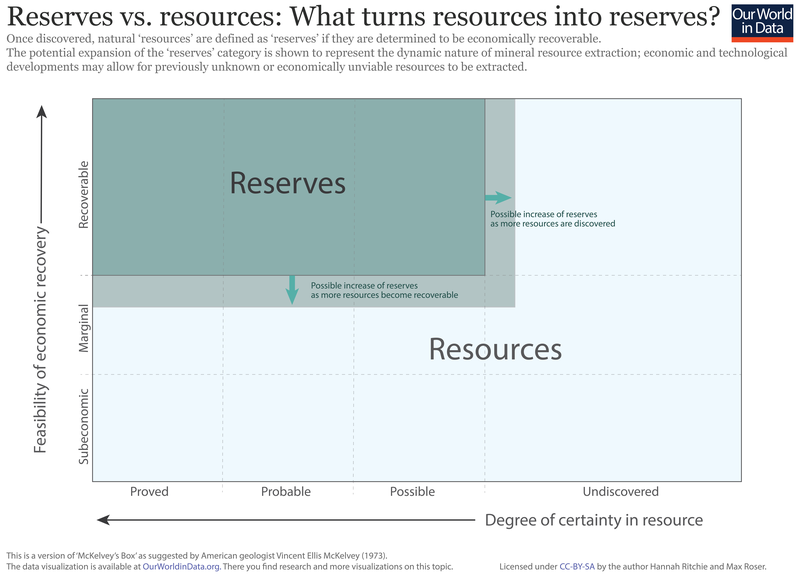 Reserves vs. Resources: When does a resource become a reserve? However, fossil fuels also have negative impacts, being the dominant source of local air pollution and emitter of carbon dioxide (CO2) and other greenhouse gases. The world must therefore balance the role of energy in social and economic development with the need to decarbonise, reduce our reliance on fossil fuels, and transition towards lower-carbon energy sources. This entry presents the long-run and recent perspectives on coal, oil and gas - global and national production, consumption, reserves, prices and their consequences. Fossil fuel production and consumption began with coal - its first reported uses date as far back as 4000BC in China where carving took place out of black lignite (one of the several forms of coal).1. However, large-scale combustion of coal is typically correlated with the period around the beginning of the Industrial Revolution. The visualisation shows the global consumption of fossil fuels - coal, oil and gas - from 1800 onwards. Overall, we see that global consumption of fossil energy has increased more than 1300-fold. As shown, coal was the first and only fossil source until the 1860s when crude oil consumption began. Natural gas production began a couple of decades later, in the 1880-90s. The 20th century saw a large diversification of fossil energy consumption, with coal declining from 96 percent of total production in 1900 to less than 30 percent in 2000. Today, crude oil is the largest energy source, accounting for around 39 percent of fossil energy, followed by coal and natural gas at 33 and 28 percent, respectively. The visualisation below presents the fossil fuel consumption mix across individual countries and regions over the last 50 years. Data for different countries and regions can be viewed using the "change country" function of the chart. Overall, we see large differences across the world, both in terms of the magnitude of fossil energy consumption and their relative mix. Total consumption levels of fossil fuels in higher-income countries have typically peaked, and are now declining as they transition towards lower-carbon energy sources. For example, the United Kingdom&apos;s total fossil fuel consumption is at its lowest level in the last 50 years. In many lower-income countries, total consumption of fossil fuels continues to increase as a result of both population growth and rising incomes (resulting in higher per capita energy demands). The relative mix of coal, oil and gas in total consumption also varies by country. China, for example, sources more than 70 percent of fossil fuel consumption from coal. In contrast, Argentina sources less than two percent from coal, with gas accounting for nearly 60 percent. The series of charts below present levels of coal production and consumption (which do not necessarily correlate) across the world, by region and country. The visualisation below shows recent trends in coal production by region, since 1981. Overall, we see that global coal production more than doubled over this period. Although too early to confirm, global coal production appears to have peaked over the years 2013-14, with several years of declining production since. This would represent a significant peak in global energy, with coal being the first fossil fuel energy source. The majority of growth in global coal production has been sourced from the Asia Pacific region, with 5 to 6-fold growth over the last 30 years. Total output from Europe, Eurasia and North America has declined during this period. Asia Pacific now produces more than 70 percent of coal, up from around one-quarter in 1981. The chart and map [which can viewed by switching between tabs below] shows the change in coal production at the country level over the longer-term. Most countries have series data back to the year 1900, with some such as the United Kingdom dating back to 1700. The United Kingdom was the first large-scale coal producer - we see its long-run trend growing, peaking just prior to the First World War, and its gradual decline throughout the 20th century. Its production levels are now comparable to those at the beginning of the 1700s. Today, China dominates global coal production, accounting for nearly half of total output. This growth has been rapid since the 1960-70s. However, Chinese coal production appears to have peaked, with continued decline in the years since. This decline is likely to have been a key contributor to the apparent global peak in 2013. The chart below shows the regional trends in coal consumption over the last fifty years. The relative regional distribution follows a very similar pattern to that of coal production. Asia Pacific is the dominant coal consumer, accounting for nearly three-quarters of global consumption. This share is slightly larger than its share of coal production, suggesting it is a net importer. In contrast, Africa accounts for only 2.5 percent of consumption; less than its 4 percent of production, suggesting it is a net exporter. Collectively, Europe, Eurasia & North America account for less than one-quarter of coal consumption. Below we see these trends in coal consumption at the national level over the last 50 years. Again, China is the world&apos;s dominant coal consumer, accounting for nearly half of global consumption. Like its production trends, China&apos;s coal consumption appears to have peaked in 2013 with several years of sustained decline. Other industrialising nations shown strong growth in coal consumption. Driven by continued population growth and economic development, India&apos;s coal consumption grew more than four-fold from 1960 to 1990, and has more than doubled from 1990 to today. Similar trends are seen across various countries, including Brazil, South Africa, Thailand, and Pakistan to name a few. The series of charts below present levels of oil production and consumption (which do not necessarily correlate) across the world, by region and country. As the visualisation below shows - global oil production is much more equally distributed across the world&apos;s regions. Unlike coal production (for which it produces a negligible amount), the Middle East is the world&apos;s largest oil producer, accounting for nearly 35 percent. The relative contribution of region&apos;s to the global total has remained generally consistent over the last 50 years, with Europe & Eurasia and North America both accounting for around 20 percent of total production, and Asia Pacific, Africa and Latin America & the Caribbean all producing between 8-9 percent. The visualisation below shows the change in oil production at the country-level from 1900 onwards, where data is available. This can be explored as a time-series or in map form. In 2014, the United States is the world&apos;s largest country producer of oil, accounting for just under one-fifth of global production. Saudi Arabia is the world&apos;s second largest producer, followed by Russia. Types of oil production have influenced the shapes of these trends over time. As explored later in this entry, oil production in the United States looked likely to peak and decline in the 1980s before rising again with the extraction of increasing numbers of shale oil resources. The chart below shows oil consumption by region over the last 50 years. Over this period, on relative terms we see a decreasing share of global consumption from Europe, Eurasia & North America in contrast to a rising share in all other regions - most notably Asia Pacific (which has more than tripled in its share of global oil consumption, from around 10 percent in 1965 to 32 percent in 2016). In comparison to oil production by region, we see that the Middle East is a much smaller consumer than producer of oil (it produces more than 30 percent, and consumes around 10 percent), meaning it is a large net exporter. In contrast, the Asia Pacific region consumes significantly more oil than it produces (only 8-9 percent production versus 32 percent consumption), meaning it is a net importer. Oil consumption broken down by country is shown in the chart below - in chart, and map form. The single largest oil consumer is the United States, with over 10,000 TWh per year. The USA is followed by China (at 7000-8000 TWh), and India at just under 2500 TWh. Brazil, Canada and Saudi Arabia are also large oil consumers. Data availability for consumption levels across Sub-Saharan Africa is low. However, given total regional consumption levels are relatively low, we would also expect consumption levels in most countries to be low relative to other regions. The series of charts below present levels of natural gas production and consumption (which do not necessarily correlate) across the world, by region and country. The regional distribution of natural gas production has changed significantly in recent decades. The chart below shows natural gas production by region from 1970 onwards. In 1970, North America, Europe & Eurasia accounted for almost all global gas production (with more than 95 percent combined). Despite both regions growing in absolute terms, their share of global production has declined significantly as regional production has diversified. North America, Europe & Eurasia&apos;s share of production has decreased to around 55 percent, with the Middle East, Asia Pacific, Latin America and Africa accounting for 18, 16, 6 and 5, percent respectively. Overall, natural gas production has nearly quadrupled over the last 40-50 years. The visualisation below breaks gas production down further to the national level, with some trends extending back to 1900. The United States is the world&apos;s largest single producer of natural gas producer, accounting for approximately one-fifth of global production. The USA is followed by Russia, Iran, Canada, China and Saudi Arabia which all produce more than 1000 TWh per year. Regional gas consumption shows a very similar distribution to gas production. In the chart below we see the dominance of North America, Europe & Eurasia in the 1960-70s, and the significant regional diversification as consumption increases across the world. Relative to gas production figures, we see that the Middle East consumes a smaller share of the global total than it produces, whilst the Asia Pacific region consumes slightly more than it produces. The Middle East is therefore a net gas exporter, whilst the Asia Pacific is a net importer. Global distribution of gas consumption at the national level also shows a very similar pattern to that of gas production. Like gas production, the United States is the world&apos;s largest consumer, followed by Russia, Iran, Canada, China and Saudi Arabia. Natural gas consumption has seen significant growth across all regions over the last few decades. This is true of both high and lower-income nations as nations seek to improve domestic energy security, and economies attempt to shift from coal consumption. Natural gas - as we explain later in this entry - produces less carbon dioxide per unit energy than both coal and oil, meaning some countries have adopted natural gas substitution as a pathway to decarbonisation. Fossil fuels are consumed for energy supply in a number of ways, including transport, heat and electricity production. In the chart below we see the relative share of coal, natural gas and oil in electricity mixes across the world over the last few decades. At the global level we see that coal is the dominant electricity source accounting for approximately 40 percent of total electricity production. This is followed by natural gas at approximately 22 percent, oil at only 4 percent (and the remainder supplied by other energy sources, including nuclear and renewable technologies). Overall, we see that the share of fossil fuels in global electricity production has not changed significantly over the decade from 2005-2015. If measured relative to the years pre-2000, the share of fossil fuels in the global electricity mix has in fact increased slightly, despite the need for energy decarbonisation. As we cover in a separate blog post, some of this stagnation in progress can be explained by the offsetting of an increase in renewable electricity with a decline in nuclear production. Whilst the terms &apos;reserve&apos; and &apos;resource&apos; are often used interchangeably, there is an important distinction between them. See Data Quality & Definitions for a visual explanation of the difference between the two. How are our fossil fuel reserves distributed across the world? We can see the distribution of coal in the chart below. The largest coal reserves extend across North America, Asia and Oceania. The United States has the largest coal reserves, at nearly 240 billion tonnes. Russia, China, Australia, India and South Africa are also rich in coal reserves. Coal sources are not homogeneous - they vary significantly in chemical composition and quality. Coal sources are typically differentiated based on carbon content; coal richer in carbon tends to produce more energy per unit mass (i.e. it has a higher energy yield). The quality of coal also has implications for air pollution. Fuels richer in carbon tend to have lower concentrations of impurities such as sulphur, meaning they produce lower levels of local air pollutants such as sulphur dioxide (SO2). nitrogen oxides (NOx), and ozone (O3). &apos;Anthracite&apos; coal is typically regarded as the highest quality, followed by bituminous, sub-bituminous and then lignite in decreasing order of quality. In the chart below we see coal reserves categorised based on type and quality. Globally we see that approximately 70 percent of coal reserves are of higher quality (anthracite & bituminous coal), with the remaining 30 percent of sub-bituminous or lignite grade. The relative share of coal quality grades vary across the world - national and regional ratios can be explored using the "change country" option. For example, almost all coal reserves in the United Kingdom are of high-quality (anthracite & bituminous), whereas Australia has more lower-grade reserves (sub-bituminous and lignite) than high-grade. The picture of global oil reserves is typically more well-known than for coal. Unsurprisingly, the Middle East is the richest region in terms of oil reserves, although on a country basis Venezuela has the largest global reserves at more than 300 billion barrels. Russia, Canada, the United States, and China also have relatively high stocks. Relative to its coal reserves (which are very small), Africa has several countries with relatively high oil reserves: these are predominantly concentrated in Libya, Algeria, Nigeria and Angola. The Middle East is also rich in natural gas. Iran has the largest gas reserves at 34 trillion cubic metres, followed by Russia and Turkmenistan. with 32 and 17.5 trillion cubic metres, respectively. Again, the United States, Venezuela, and Saudi Arabia also have relatively high reserves. Overall, the maps for oil and natural gas tell a similar story; the distribution of coal, however, is notably different. Many have attempted to apply Hubbert&apos;s theory at not only a regional, but also a global level. Most attempts have, however, been proven wrong. We have provided discussion on predictions of peak oil - and why they are often proven false - in our blog post "How long before we run out of fossil fuels?". The obvious question people ask with regards to fuel reserves is: when are we going to run out? Fossil fuels are, of course, are finite resource and we will eventually run out if consumed indefinitely. This question is an important and complex one to answer which we have addressed in our blog post "How long before we run out of fossil fuels?". The chart below shows the index of average fossil fuel prices - for coal, oil and natural gas - over the last 30 years. This index is measured relative to the year 2000, where prices in 2000 are equal to 100. The charts in the sections to follow provide more detail on the absolute price as well as changes in prices of each fossil fuel across regional sources. Overall, we see that natural gas prices have been the least variable over this period (remaining relatively close to 100 across the last 30 years). Coal has shown the greatest volatility - rising to four times the 2000 price in 2008, and nearly 3.5-times in 2011. Oil has similarly shown volatility - varying by two to three-fold over this period. In the chart below we see the long-term trend in global crude oil prices, measured in 2016 US dollars per barrel.Overall we see strong volatility in oil prices, with significant spikes and shocks. In 2016, crude oil prices were US$43.73 per barrel - this represents a 275 percent drop in prices from 2011 when prices close to an all-time high at US$118.71. 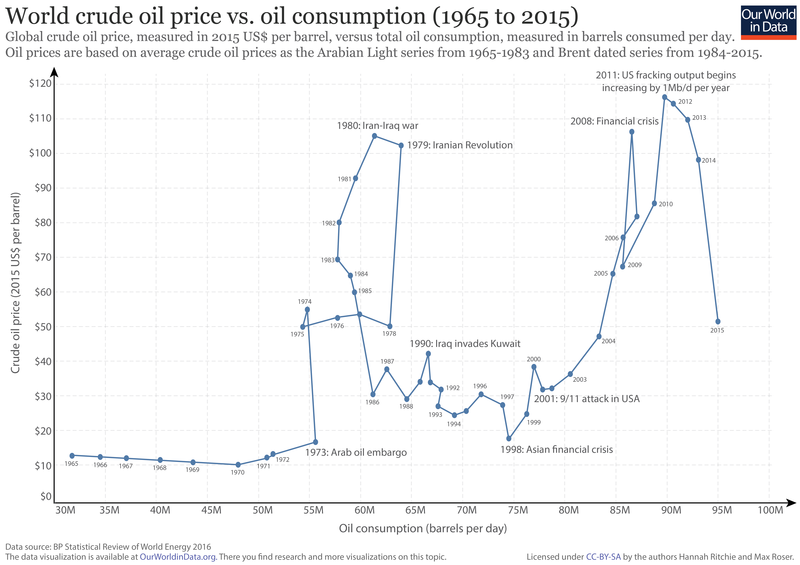 Overall, we see that oil prices were relatively consistent throughout the 19th and first half of the 20th century, until a significant rise in prices in the 1970s. Prices spiked in 1980, reaching a high of US$107.27 before a rapid decline which coincides closely with the OPEC embargo of the early 1980s. Oil prices later spiked again in 2008 before crashing following the financial crisis, with a later spike in 2011, falling to very low oil prices in 2016. The visualisation below shows the crude oil spot prices across various oil blends, as measured in US$ per terawatt-hours (rather than per barrel) for comparison to energy prices of coal and natural gas below. As shown, the key oil blends have a closely matched spot price (despite very small differences). In 2016, crude oil spot prices averaged around US$25 per terawatt-hour - the most expensive of the fossil fuels (as seen for coal and natural gas in the sections below). The chart below shows coal prices over the last 30 years across different regional sources, measured in US dollars per terawatt-hour. Unlike oil, where blends tend to converge on a very similar spot price, coal types can vary quite significantly. The quality of coal deposits - in terms of their carbon content - can have a notable impact on their energy density, which will determine the tonnage of coal required for a give energy output. The chart below shows natural gas prices over the last 30 years across different regional sources, measured in US dollars per terawatt-hour. Like coal, natural gas prices can vary significantly by source - this difference has been more marked over the last decade where gas from the United States can be up to five times cheaper than that in the Japanese markets. This difference in price is partly explained by the differences in natural gas source. Accessible and economic shale gas supplies in the United States have grown dramatically over the last decade; this large supply security has leading to a significant fall in US gas prices. In contrast, much of natural gas in Asian markets is sourced as liquefied natural gas (LNG). LNG - which is compressed to form a liquid - is easier to to transport and store in a non-pressurized environment. However, this liquefaction process tends to incur a &apos;sunk cost&apos;, leading to relatively higher prices. The energy industry has historically - and continues to be, in many countries - a large source of employment. In the charts below we see the long-term trends of employment in the coal industry in the United Kingdom (where large-scale coal production began) from 1873 to 2016. The chart below shows UK coal employment in absolute numbers - this includes the number of workers contracted by the coal industry for work. In absolute numbers, employment in UK coal peaked in 1920, with nearly 1.2 million working in the industry. Since then, employment has continued to decline, reaching a low of less than one thousand workers in 2016. We can also visualise changes in coal employment by plotting the numbers in UK coal as a share of the total UK workforce. This change in share over time is shown in the chart below. Due to changes in the total workforce numbers, UK employment peaked slightly later in percentage terms, peaking at nearly six percent in 1924. This has declined to a low of less than 0.01 percent in 2016. In the 1920s, 1 in every 20 workers in the UK were employed in the coal industry. In 2016, this has reached a low of only 1 in every 40,000 workers. Fossil fuels can have short-term (in the form of local air pollution) and long-term (in the form of climatic change) environmental impacts. Fossil fuels - being the dominant source of global energy production - are a key source of carbon dioxide (CO2). Although there can be notable differences in emissions factors between different types of a given fuel (for example, differences in coal types), there are some more general trends in the relative emissions between coal, oil and gas. Typically coal produces the most CO2 per unit energy, followed by oil (which is about one-third lower than coal), and natural gas (which can produce around half the emissions of coal). As a result, coal is often termed the most polluting of the fossil fuels. Several countries - the largest example being the United States - have therefore achieved carbon dioxide reductions in recent years by substituting coal production in its energy supply with natural gas. In order to meet our international climate change target of limiting global warming to 2 degrees celcius (2°C) above pre-industrial temperatures, we can emit only a limited amount of greenhouse gases. This limit on emissions is often termed our &apos;carbon budget&apos; - a budget of much carbon we can emit if we want to achieve a given probability of limiting warming to 2°C. The reserves of fossil fuels which we must leave untouched to stay within our carbon budget are often referred to as &apos;unburnable carbon&apos;. These reserves are important, not only from an environmental perspective, but also an economic one. According to a widely-quoted study by Carbon Tracker, there is significant potential for this unburnable carbon to result in major economic losses.7 If capital investment in carbon-emitting infrastructure continues at recent rates, it estimates that up to 6.74 trillion US$ (nearly twice the GDP of Germany in 2016) would be wasted over the next decade in the development of reserves that will eventually be unburnable. The chart below shows the crude oil price (measured in 2015 US$ per barrel) versus global oil consumption, measured in barrels per day. Each marker represents the price-consumption values for a given year from 1965 to 2015. Key political, economic and social events have also been detailed below. This chart is also available to view in interactive form, here. Overall, we see that the sharp changes in oil price coincide with large sociopolitical events - for example, the OPEC oil embargo of 1973 led to a sharp rise in prices; the Iranian Revolution of 1979 and the 2008 financial crisis to a sharp decline; and a continued fall in prices since 2011, when US output of shale oil has been consistently growing. The terms &apos;reserves&apos; and &apos;reserves&apos; are often used interchangeably. However, there is an important distinction between the two. The chart below explains this distinction visually. It is true that every reserve is a resource, but not every resource is a reserve. There are two requirements which determine whether a mineral resource becomes a reserve. The first is the degree of certainty that it exists: the planet likely has many mineral resources which we have not yet discovered. So to be defined as a reserve, we must have either a proved, probable or possible understanding of its existence. The second criteria relates to the economic feasibility of being able to access and extract the mineral resource. To be defined as a reserve, it must be economically and technologically viable to recover. If the economics are subeconomic (i.e. would result in a net loss) or marginal, a mineral resource is not defined as a reserve. Whilst the original source of this concept - the American geologist Vincent McKelvey - visualised it as a static box, this transition between resources and reserve classifications is dynamic. As we discover previously unknown resources, and develop improved extraction technologies for economic recovery, this reserves box can grow with time (or shrink as we consume them). To maintain consistency between metrics and sources, we have attempted to normalise all energy data to units of watt-hours (Wh), or one of its SI prefixes. The table below shows the conversion of watt-hours to the range of SI prefixes used. Available at: Both datasets are online at www.tsp-data-portal.org. The IEA is publishing the World Energy Outlook. EIA is a US government agency. Data: Production & consumption of energy. Data on: Energy production and imports - Consumption of energy - Electricity production, consumption and markets. Adelman, M. A. (1984). International oil agreements. The Energy Journal, 5(3), 1-9. Available online. Nuclear Energy and the Fossil Fuels, M.K. Hubbert, Presented before the Spring Meeting of the Southern District, American Petroleum Institute, Plaza Hotel, San Antonio, Texas, March 7-8-9, 1956. Available online. Climate Tracker Initiative (2011). Unburnable Carbon - Are the world's financial markets carrying a carbon bubble? Intergovernmental Panel on Climate Change (IPCC). Guidelines for National Greenhouse Gas Inventories (2006). Available online. Carbon Tracker (2013). Unburnable Carbon 2013: wasted capital and stranded assets. Available online. Chen, H., Liao, H., Tang, B. J., & Wei, Y. M. (2016). Impacts of OPEC's political risk on the international crude oil prices: An empirical analysis based on the SVAR models. Energy Economics, 57, 42-49. Available online.